Do you know how to make ice at room temperature? Maybe not. It may sound too good to be true but you can do it with our educational DAC, SEED. It is like taking candy from a baby. We produced a unit that makes 1 GPa and gets ice from tap water in 5 minutes. That’s it. You don’t need to do complicated preparation like usual DAC research and this unit is light enough to take along anywhere. Therefore, we get a lot of positive feedback from elementary, junior-high and high schools. We would like to serve as a bridge for the promotion of friendly relations between ultrahigh pressure research and promising children. Of course we recommend this kit for professionals, whether they be researchers or professors. such as several hundred giga pascal, with Diamond Anvil. We have been producing many types of Diamond Anvil Cells for a long time. There is no standard model about Diamond Anvil Cell. Spec of each model is different and it depends on your environment and experiment. Using our data, we can suggest certain cells based on your manifacturing plans. We can provide you various models of cells. Wedge-sliding type and gas-driven type are our standard models. We have those cells’ basic design drawings. You can use our standard one or any improvement will be welcome. If you tell us your experiment description we will propose a couple of suggestions. 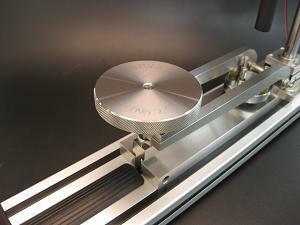 A Diamond Anvil is an essential part for ultra high pressure experiments. a field of several hundred giga pascals on the experiment. The quality of cutting diamond anvil from the stone crystal has a decisive influence on high-pressure generation using a diamond anvil cell (DAC). Recently, we have established a high-precision processing technology for the cutting. The development enabled to design a simple and convenient DAC without any adjustment mecanism to parallelize culet-faces of opposite anvils. We produce single crystal diamond anvil, sintered diamond anvil, sapphire anvil and more. We have increased our lineup of products developed for “SH anvil” as high quality and high accuracy. And “reasonable anvils” these days. You can choose from among them according to your individual needs. Please check them out and pick up suitable items for you. Below is one of our techniques. on the cullet of syngle crystal diamond. We do procurement to polishing of diamond by ourselves. So, we will meet a wide variety of customers’ demands promptly. As you know, quality of your diamond is very important because it is used under severe condition. We place the most importance on size acuracy, surface acuracy, parallel acuracy, and inspection. Plus, we do especially on cutting. It would not be an exaggeration to say that our diamond anvil possess the world’s highest quality. We can produce diamond anvil as following size. Gasket is one of essential parts for ultrahigh-pressure experimet. Can you image a thin plate that has tiny hole in the middle? It is called gasket. We usually use SUS or rhenium for this part. You put “sample” into this hole and sandwich it between culets of anvils. 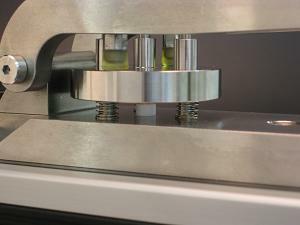 When those culets make ultrahigh-pressure, the sample changes to different material. If you want to get good result for your experiment, gasket needs precise hole at the very center. We produced EDM that makes superfine hole. This enables gasket gets 0.005mm diameter hole at the smallest. 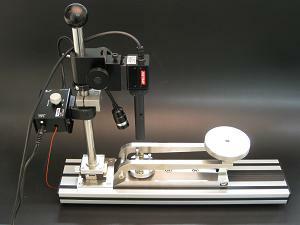 Pressurize jig, seat, minute specimen and other production tools. We will provide the suitable products for you that you requested. Normaly, it has many problems because it needs cermet or other metal frame during sintering. Ex. Cracks by coefficient of thermal expansion difference or remaining stress. We improved our sintering technique without metal frame. We can produce larger one which is untill 24mm. We are developing X-ray transmission now. with our custmers’ needs, which have come from various industries, not just the ultra high pressure industry.